October 2012: stumbling off the red-eye at JFK, I took the New York State Thruway, Interstate 87, north to Saratoga Springs, spent a few hours on client matters in a Starbucks there, and then drove the still familiar roads east to Cambridge, New York. I had a reservation at the Peace Be Still Motor Inn, on New York State Route 22, and dinner plans at Momma’s just up the road. The two families spent a lot of time together at first. Here is my sister Sue with Jean in Ottawa the following summer. The guy with them was named John, but I don’t remember much about him. We also visited Niagara Falls together that summer. More years ago than I like to count, a busload of English schoolchildren were unloaded in a parking lot on a cold April evening in Saratoga Springs. It had been one of the snowiest winters on record, and the parking lot, like the roads we had driven from Niagara Falls, were covered with snow and slush. We were there to be dispersed among our US exchange families in the area. My host family were the Roys of Cambridge, on the east side of the State, maybe 20 miles above the Vermont – Massachusetts State line. They were six: Paul, who managed the local A&P, and Marie, a nurse and his GI bride from Leeds in Yorkshire; and their four children, Pat (whom I rarely saw because she was married and lived near Boston), John Paul (who was older and cool and occasionally visited home from SUNY Plattsburgh), Jean (a junior at Cambridge Central School, and the sweetheart of a person I exchanged with), and Will (her adorable kid brother who would later announce his first intimate act at a young age to practically the entire family!) They were the perfect hosts, and it was the perfect exchange. My future as a US immigrant was sealed during those first three weeks on American shores. Bernie, Kathleen and Lance posed this themselves, and somehow gave me a little reprint. It’s grainy and unclear, but I just love the way that they looked. Sealed by the Roys, by Cambridge Central School (the first coed school that I had attended since age 11), by Johnny’s in Hoosick Falls (the local dive bar that served those under age) and by McDonalds in North Adams (who can forget his or her first Big Mac, especially after eating “beefburgers” in Wimpy Bars in England!) By Jean, by Kathleen, by Bernie, by Lori, by Doug, by Lance, by people whose names I forgot long ago but whose warmth and friendliness have stayed with me. It all felt so much more human, so much less intellectual and defensive than the England of my youth. I would return to Cambridge to visit the Roys again and again over the years: it always felt like coming home. Jean stayed near her parents even when she got married and settled down and raised her own family, as did Will. The ladies during our dinner at Momma’s. It’s hard to believe that each is close to my age! It wasn’t a big one, as reunions go, but the energy was there. But somehow I only ever visited the Roys themselves. Jean’s friends from Cambridge Central School didn’t hang around the house any more, of course, not like during their last years of High School when I visited all the time. I rarely saw any of them after the first couple of years, even though I came back to Cambridge occasionally through 2004 to see Marie and Paul, my adopted US parents, while they were both still alive. At my request, Jean had scheduled a dinner that night, the two of us with a few of her friends. Kathleen was already at Momma’s when we walked in, and Geri and Diane were not long in arriving. Lance didn’t show. For obvious reasons, I’m very fond of this photo, and have posted it on line before. Lance is showing me how to smoke in the boys room at Cambridge Central School: the key was to encourage the smoke to leave by the vent. Now tell me that the Administration had never noticed this! What is it about reunions that works so well, even tiny ones like this? Five people had dinner together, with glasses of wine and a beer, nothing more. Jean and I had kept in touch, big gaps here and there, but I had not seen the other three women for forty years. It was as if those forty years hadn’t happened: I was with those same high school girls: no change. How much can I say without offending anyone? Not a lot! The smiling vamp was still smiling, still a vamp, the reflective artist was still reflecting, still an artist, the friendly socialite was still friendly, still a socialite, and Jean, as ever, was still the kindest person in any room. Everything that you need to know about life can be found in a small town. Why wasn’t Lance at the dinner? The woman who was going to invite him said that his number wasn’t listed. When I asked the owner of Momma’s if anyone at her bar knew Lance’s number, her husband came to the table with the local phone book, and there was Lance! It turned out that the first and former husband of the woman who was supposed to invite him was and is good friends with Lance. She is perhaps not the best of friends with her ex: don’t you love this kind of dynamic! Lance and his daughter, grandson, son-in-law and son in the seed company offices. Only his grandson had never worked for the company. It was the same old Lance, in spades! I called him from Momma’s, and finally met him the next morning, ensconced in the seed company he owns and runs, surrounded by his children, grandchild and friends. The latter were his employees, but it was hard to tell. The guy who showed me how to smoke in the boys room at Cambridge Central School had not lost his ability to endear himself to others. He had weathered a fire that destroyed almost the whole business in the middle of the night, and the business he had started looked nothing like the one he now had, an oasis of prosperity in a town whose economy is a bit of a desert. He was justifiably proud of what he had achieved. Time to move on: the 30th reunion of the Class of 1982 of the Yale Law School (motto: don’t forget the “the!”) started that same afternoon in New Haven. Hanging out with Lance and his family at the seed company was such a pleasure that I ended up leaving Cambridge later than planned, and completely missed US Supreme Court Justice Ruth Bader Ginsburg’s eagerly anticipated talk. Oh well. David Boies, a guest of honor at the reunion where he received an award, addressing the throng, I think on the Saturday. © Harold Shapiro. 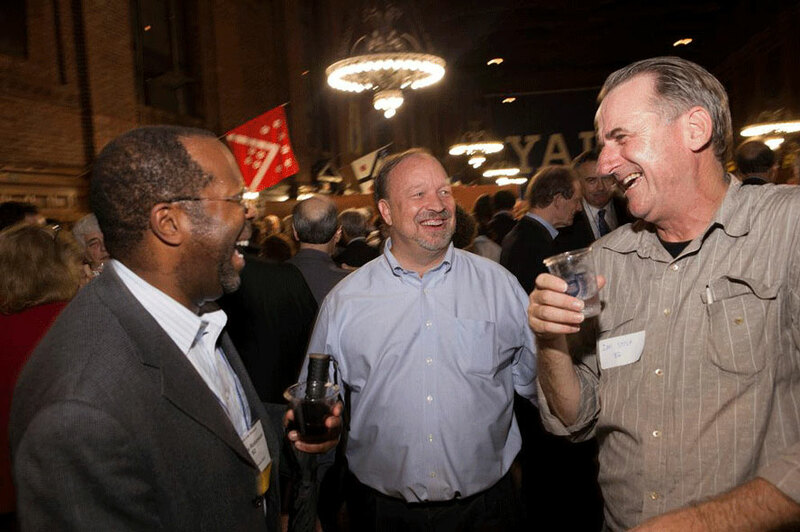 Yale posted this one on its alumni reunion website. I did make it in time for the alumni dinner at 6.30 pm. The dinner was held at University Commons, just a block down Wall Street from the law school (yes, it actually is located on New Haven’s own Wall Street!) This was an event with all the reunion classes mingling, held in a wood-paneled hall of imposing dimensions, and it was fun for all. We chatted and mingled, imbibing a little here and there before sitting down at our appointed table. We imbibed more as the chatting continued waiting for our carefully orchestrated turn in line for the food: it was a long wait! Finally it was our turn, and in the buffet line, I bumped into a member of the class of 1967 who had been Attorney General of the United States under President George the younger. That wasn’t why his name jumped out at me, though. For me, Michael Mukasey had been a respected litigation partner at the Manhattan law firm where I had chosen to spend my second summer of law school. Summers at law firms were a great way to defer the considerable costs of the school itself. Yale took this one, this time at the 2012 Alumni dinner. Here I am, to use a little London slang, with a right couple of Charlies! © Harold Shapiro. One look at Judge Mukasey’s nametag, and I floated off into space, back to that summer. Patterson Belknap Webb and Tyler had looked like a good pick, but a silly little thing went wrong my first week there. An ERISA partner named Arthur Kroll wanted me to work on a difficult assignment all my first weekend, and I had promised to move Meri Ann from New Haven to Manhattan that weekend. We were moving in together for the summer, into a fabulous little apartment on Waverly Place in Greenwich Village. So I put that move first, and turned the assignment down. No big deal, I figured, carefully explaining the reason for my refusal to anyone who would listen: it seemed eminently reasonable to me! With Meri outside our Village apartment that summer of 1981. 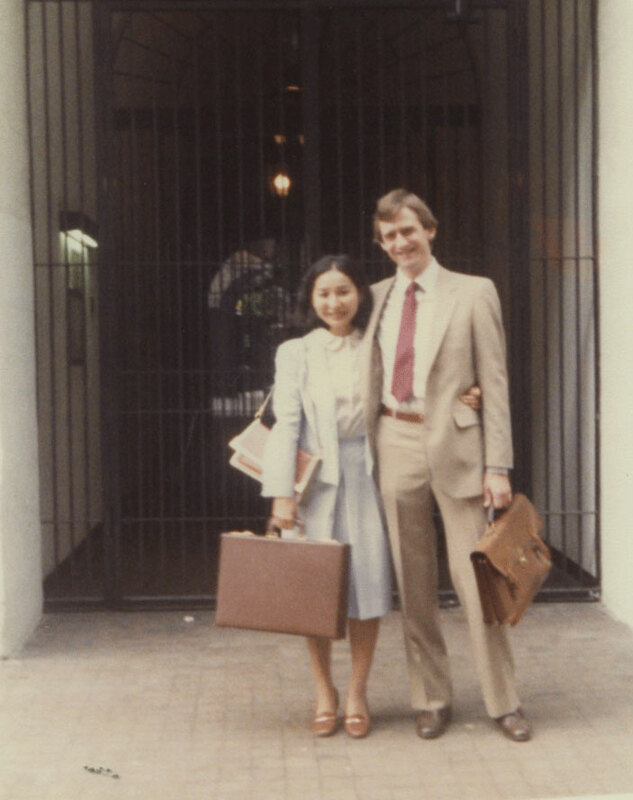 On the back of the photo, she wrote that we were “off to conquer the world of law from the iron-gated entry of our Village apartment building.” Each of us was “summering” at a New York law firm. Maybe not to the firm! My last assignment there was distinctly odd. They had me write a brief, without setting out the facts: someone else was doing that. Which made for a crazy brief! Briefs are legal arguments applied to a given set of facts. Here, the facts were given me, which is how I was ale to craft legal arguments based on them. But no-one reading the brief could make sense of it without those facts. I was a little worried writing it, but had figured out that my initial refusal to work a weekend had not been greatly appreciated. So I was not going to turn anything else down, however silly. I figured that for some reason they had someone else, maybe another summer associate, prepare the statement of facts. Made no sense to me, but hey, the firm must have known what it was doing! Apparently they did, but not exactly in the way that I thought. In my exit interview a few days later, they then told me that I couldn’t write, citing this last assignment as proof, and that as a result they would not make me an offer to return. Oops: this was not a good thing! My law school summer dance had ended with me the wallflower on the side of the dance floor. A pic in that apartment, with Madison, a friend of Meri’s from her Marin County High School, fooling around. And the wallflower had been seriously panned! I wasn’t just unattractive to them personally: they said that I couldn’t dance! If the firm had wanted not to make me an offer because I made a mistake that first weekend, they could have easily done so. Perhaps they did not want to publicly chastise a summer associate for putting his personal life first. Law firms need a great deal of work out of their associates, but because law students focus on quality of life issues when picking a firm, no firm likes to admit that its need for hard work may interfere with an associate’s personal life. Yale put this one up also on the 2012 law school reunion web page. University Commons on Friday night during the reunion dinner. Quite an atmosphere, wasn’t it? © Harold Shapiro. Burke Marshall, the hero of this little story, complete with his astonishing resume, as reproduced in the law school’s facebook that year. It’s worth a click, just to see what can be done. It was all okay. I could write: Burke Marshall said so! A hiring committee had contrived to say the contrary, but he had even seen through how they did so. Life continued on, and I rarely thought of Arthur Kroll, or Patterson Belknap for that matter. Even at the time, I almost never talked about what had happened at the end of the summer, not with friends, not with anyone. I had known enough to simply fix the problem, with Burke Marshall’s help, and plough onward without dwelling on it. 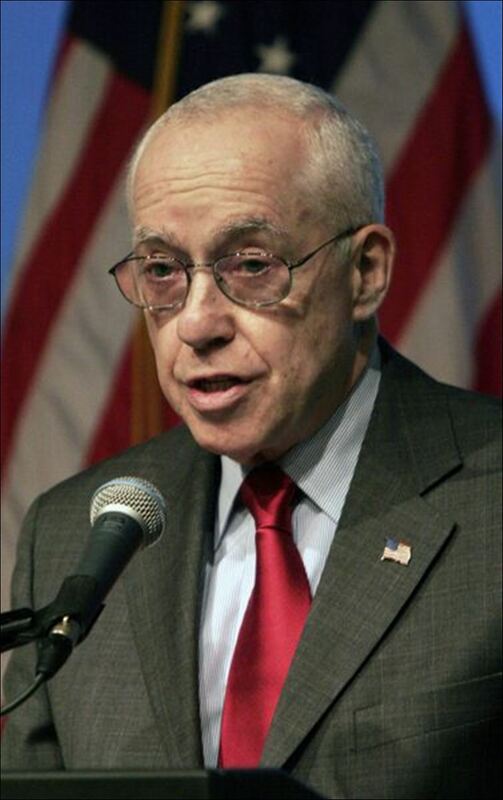 Judge Mukasey during his time as Attorney General of the United States. After returning from the reunion, I looked him up and found out that he had also served as Chief Judge of the US District Court for the Southern District of New York. Another amazing resume. In line at the reunion buffet across from Judge Mukasey, all this had come back to me in a split second. I told him that I had summered at this firm. He gave me a very personable smile in response. I blurted out: “that firm treated me very badly. Your ERISA partner, what was his name? Kroll! That’s right.” I couldn’t believe myself: what was I doing! Here I was, accosting a former Attorney General of the United States over the pasta and the grilled fish at a reunion dinner! That summer, so long forgotten, had welled up again, triggered by a simple name card. I will never drink again! I couldn’t seem to stop until the punch line. “I can’t tell you how vindicated I felt when I found out that Kroll had been disbarred!” That discovery had been made many years after the event, when quite by chance I found the story online. Fortunately, my little monologue was done, and I turned quietly back to the task in hand at the buffet. Arthur Kroll was disbarred by the New York State bar for falsifying expense reports to his firm. Neither his firm nor the State Bar had believed his assertions on that occasion. What had he said about me to induce his firm to act the way that they did? They wouldn’t have gone out of their way to diminish my professional capacity for nothing. Somehow, this later disbarment confirmed the earlier lie. Sunday’s reunion brunch for the class of 1982 was hosted by Professor George Priest and his better half. Here are a selection of us feeling well fed in their back garden. Judge Mukasey wandered off back to his class’s table, perhaps reflecting on the strange encounters which life can offer! My apologies, Judge. We in the class of 1982 ate our dinner and then left early, as is our wont, ambling away to a bar to catch up and listen to each other’s stories. I had been very grateful to Burke Marshall and the law school back in 1981, for helping me fix the problem, and I felt oddly grateful again after the incident in the reunion buffet line. Something had been lurking quietly under the surface, and here it was, released, out in the open, purged for good. Maybe I will have another drink!